If you have a Salt Chlorinator, these products should interest you. Click Any Image . . . for more product information!!! Get Extra Value and Savings on these Special Product Offers. Do it now . . . safe and secure, on-line ordering is just a click away!!! We are an authorized seller and all products include a factory warranty. Scroll down to browse through information on 6-in-1 Digital Water Chemistry Testers and 3 LaMotte Professional-Grade Salt Kits. The Website Store Directory contains an alphabetized listing of all products for sale. We don't just sell products. We help you make a better-informed choice, by providing all the information, you might require. Need ordering help? Scroll down the page, for the Order Desk Telephone Help Number. All items ordered will end up in the same shopping cart, no matter on which page of this website, the items are located. These items can be ordered on-line, from askalanaquestion.com, with convenience and security. All Major Credit Cards and PayPal are accepted. Order one today. Oxidation-Reduction Potential (ORP) and Temperature. Calcium Hardness, Cyanuric Acid and Phosphates. The LaMotte PRO Salt & TDS Test Kit #1749-Kit is the same as the above, except that no test strips are included. The LaMotte #1762-Kit has a Professional-Grade, all-digital tester. It features 2 sensors, for testing pH and ORP and includes pH buffer tablets, a tablet crusher and a carrying case. Click the monitor to watch a product video. The SafeDip 6-in-1 Digital Water Chemistry Tester is a hand-held, digital meter, designed to measure several important pool and spa chemistry test factors. It can test for Salt, TDS (Total Dissolved Solids), Free Chlorine or Bromine, pH, ORP (Oxidation-Reduction Potential) and Temperature. The ability to test for salt makes this an especially ideal tester, for use with salt chlorine generators. The TDS test helps manage extreme hard water problems. The ORP test measures the true effectiveness of chlorine, at the current chemistry of your pool water, telling how well the pool or spa is being sanitized. The TDS and ORP can only be performed, by using this type of water testing technology. 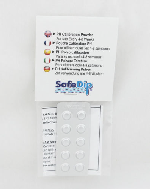 The SafeDip Tester is all-digital and is easy to use. Simply remove and fill the built-in sampling cup with pool or spa water, remove the black rubber sensor protector, insert the tester in the sampling cup and press the start button, In just a few minutes, you'll have a complete set of 6 test readings. It evens stores the previous test results, so that you can make a comparison. Now includes an Online Interactive Chemical Dosage Link. Click above images to see an enlarged view. • Large all-digital LCD display. • Easy push- buttons operation. • Eliminates all color matching. • Measures Free Chlorine, pH, Salt, TDS, ORP, Temperature. • An ideal tester for use with Salt Chlorine Generators. • ORP (Oxidation-Reduction Potential) helps measure chlorine's effectiveness. • Chlorine or Bromine readings show up as Low, Good or High and are based on the ORP values, showing the true effective chlorine content, providing better information. • TDS helps determine when replacing some water might be in order. • Measures Salt and/or TDS readings up to 8800 PPM. • Measures pH from 0-14, with 0.1 accuracy, within the pH 6.0 to 9.0 range. • Commercial grade sensor technology. • Power source: two AAA batteries (included). • LED indicator light signals the swimming conditions are right. • pH probe is easily replaced. • Easy to use with pools, spas, hot tubs or ponds. • Built-in sample cup allows user to sample the water and take readings away from the pool-side or spa-side. • One step calibration is fast and easy to do. • Includes a packet of pH 7.0 Buffer powder, for standardization use, which is performed on periodic basis (monthly). • Probe protector cap help prevent damage to the electrodes. • Probe protector caps stores conveniently, so it is not easily lost. • Probe can be replaced, if it is broken or fails to work properly. • Automatically stores the previous test results, for easy comparison. • Shipping size: 10" x 4" x 4". • Shipping Weight: 2 pounds. • One year Factory Warranty. One, Two, Three, Four and Done!!! It's that simple!!! Click here to view the SafeDip Instruction Manuel Download (pdf). Tests for Salt, TDS. Temperature, Free Chlorine, Total Chlorine, Bromine, pH, Alkalinity, Calcium Hardness, Cyanuric Acid and Phosphates. If your pool or spa uses a salt chlorine generator, this Professional-Grade Test Kit, providing all the testing, you should require. The #1749 Tracer PockeTester digitally measures salt and TDS levels, from 0-9,999 PPM and Temperature from 32-149°F. The Insta-Test PRO 600 Test Strips, contain 100 strips and tests for Free Chlorine (0-10 PPM), Total Chlorine (0-10 PPM), Bromine (0-20 PPM), Alkalinity (0-240 PPM), pH (6.2-9.0), Total Hardness (0-800 PPM) and Cyanuric Acid (0-250 PPM). The Insta-Test PRO Phosphate Test Strips contain 50 strips and measure phosphates, in the range of 0-25000 PPM. Includes a convenient carrying case and a salt calibration standard. Professional-Grade, but easy enough for home pool or spa use. Also available as a kit, without the test strips. See below. 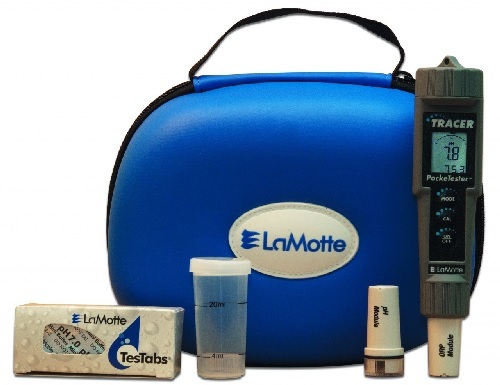 ● Digitally Tests for Salt, Total Dissolved Solids and Temperature, using a #1749 LaMotte PockeTester. ● Eight additional tests are preformed, using LaMotte Insta-Test Professional-Grade Test Strips. ● Easy to use PockeTester and Dip-n-Read Insta-Test Strips, for quick results. ● Suitable for use by a Pool or spa owner, as well as professionals. 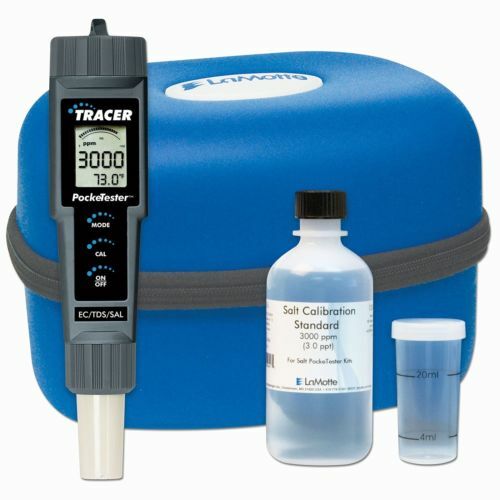 PockeTester Kit If your pool or spa uses a salt chlorine generator, this Professional-Grade Test Kit, providing all the salt and TDS (Total Dissolved Solids) testing, you should require. The #1749 Tracer PockeTester digitally measures salt and TDS levels, from 0-9,999 PPM and Temperature from 32-149°F. ● All the salt and TDS testing you need, for a salt chlorinated pool or spa. This waterproof test meter measures pH and ORP (Oxidation Reduction Potential). The tester’s probe is dipped into a sample of pool water and the results are ready instantly. This PockeTester measures the pH from 0.00 to 14.0. ORP is measured from -999 mV to 999 mV. ● Digitally Tests for pH and ORP (Oxidation-Reduction Potential). ● Suitable for use by a pool professional or a facility operator. ● Complete with 2 sensors, pH tablets, tablet crusher and a carrying case. 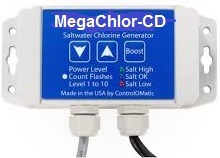 If you have a salt chlorine generator . . . you'll want one of these 5 testers!!! Now available in a money-saving package of 5 strips of 10 tablets each. Click any tester image to see an enlarged view. Place order above. Shipping charges will be calculated and added to the order, based on quantity and destination. Some Orders Outside Of The Continental U.S. May Require Additional Shipping Charges. Shipments are made via Priority Mail International, with an expected delivery of 7-10 days, after shipment. You reserve the right to cancel and receive a full refund, should you decline to proceed with the shipment. All items, accepted for return, will be subject to a 15% restocking fee, because of the Free Shipping policy. 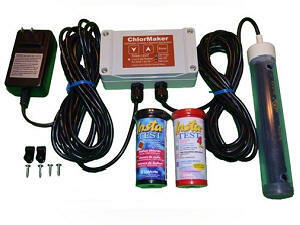 Automated Salt Chlorine Generator, with Chlorine Detection Technology, for Spas, Swim-Spas and Pools. A Hybrid-Epoxy Coating, for refinishing Plastered or Fiberglass Pools/Spas.